Tags are marker values that that you can use to identify objects in your Project (see documentation on Tags for further details). To add a new Tag, click the plus button (+) at the bottom-right of the list, and name your new Tag. Note that once you have named a Tag, you cannot rename it. To remove a Tag, click on it and then click the minus (-) button at the bottom-right of the list. See in Glossary graphics in the 2D system. Sorting refers to the overlay order of different Sprites. To add and remove Sorting Layers, use the plus and minus (+/-) buttons at the bottom-right of the list. To change their order, drag the handle at the left-hand side of each Layer item. See in Glossary, so that they are only applied to the relevant groups of objects. 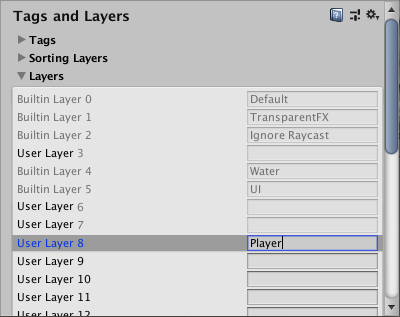 In the Tags and Layers Manager, the first eight Builtin Layers are defaults used by Unity, so you cannot edit them. 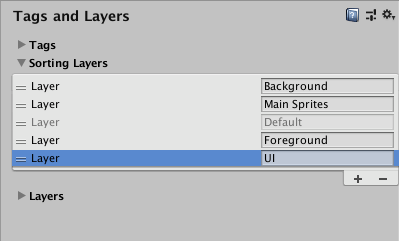 However, you can customise User Layers from 8 to 31. 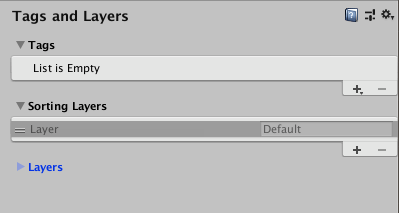 To customise User Layers from 8 to 31; type a custom name into the text field for each one you wish to use. 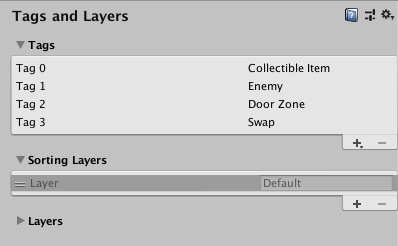 Note that you can’t add to the number of Layers but, unlike Tags, you can rename Layers.